Everywhere you turn, you hear about the rebirth of socialism, right? Democratic presidential hopefuls such as Bernie Sanders, Elizabeth Warren, and Kamala Harris, among others, are calling for massive expansions of the state as part of their platforms. This may not be classic, control-the-means-of-production socialism, but it’s as close as we’ve seen in decades. Rep. Alexandria Ocasio-Cortez (D-N.Y.) belongs to the Democratic Socialists of America, which is seen as a rising power within electoral politics. A slim majority (51 percent) of millennials have a positive view of the term socialism. Americans have different things in mind when they name the government as the most important problem. An analysis of the verbatim responses to the question from the latest survey finds that 11% of Americans specifically cite “Donald Trump” as the most important problem, while 5% name “the Democrats” or “liberals” and 1% “Congress.” About half of those who say the government is the most important problem—18% of U.S. adults—blame both parties or cite “gridlock,” “lack of cooperation” or the shutdown more generally. The latter figure has grown from 6% in December and 12% in January…. Federal government shutdowns have clear, negative effects on Americans’ views on a variety of measures, including their general satisfaction with the direction of the country. But shutdowns aside, Americans’ views of the government itself as a problem—rather than the means of solving problems—have increased over the past two decades. 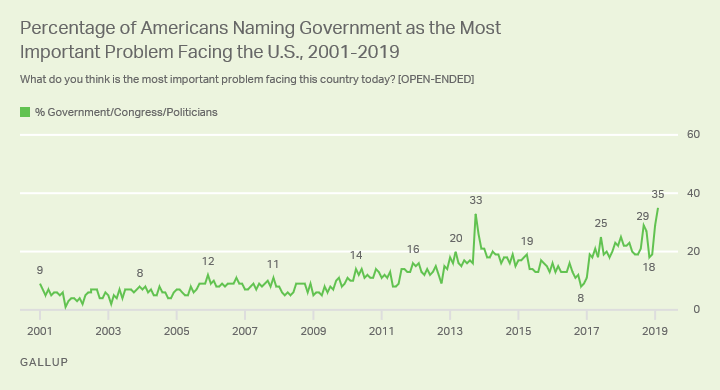 On one end of Gallup’s 2001-2019 trend is the record low of 1% naming the government as the greatest problem, recorded one month after 9/11. On the other end is the latest 35%, as the longest shutdown on record left bad feelings on both sides of the political aisle. If people are thinking Donald Trump or Republicans when they say government, perhaps socialism really is on the grow and will be widely embraced not just by Democrats but by the average American. Then again, increasing the entitlement state in a way that stops short of textbook socialism requires a lot of faith and trust in government. And there just isn’t a lot of that to go around. I’ve documented before research that shows citizens counterintuitively demand more government when trust and confidence in government declines, but the sheer magnitude of, say, Bernie Sanders’ platform is going to be a tough sell in a country where more and more of us are leaving established parties and identifying as independents. It’s possible that a plurality or even a majority of Americans will swoon after years of demonstrable incompetence and bad-faith dealing from both Democrats and Republicans. But it’s not very likely.